Samford University is hosting two sessions June 20–24 and June 27–July 1 of Animate, an academy in worship, theology and the arts for youth. Each session includes approximately 50 participants from South Carolina, Georgia, Alabama, Texas, Virginia, Michigan, Tennessee and Maryland who will join together at Samford for a week full of spiritual nourishment. Highlights will include unique worship services, community projects and field trips, and performances by Christian music groups. The first week will feature Urban Doxology, a ministry from the Church Hill neighborhood of Richmond, Virginia. They are an active part of East End Fellowship, a community that endeavors to be a faithful presence seeking God’s joy and justice for its neighborhood out of love for Christ. The second week will feature J. Kwest, an Emmy Award–winning pastor from Chicago, sharing meaningful stories through his music. Participants also will connect with the Birmingham community at a dinner at the Birmingham Civil Rights Institute on Wednesday evening both sessions. Samford President Andrew Westmoreland will speak during the first week. Additionally, attendees will bake bread and prepare food baskets for local ministries as part of their Christian outreach. Animate is open to any student who has completed 7th grade through 12th grade, and is interested in becoming a better worshiper or exploring a vocation in a worship and arts-related field, according to Eric Mathis, Samford assistant professor of music and Animate director. 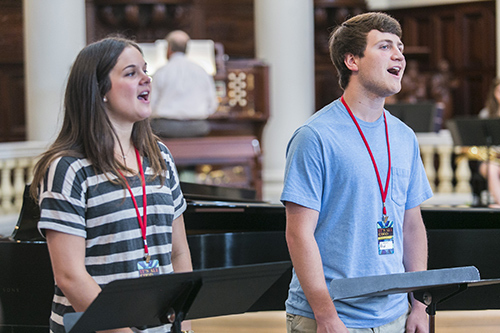 The program exposes participants to a wide range of worship styles and practices each morning and evening, led by Samford students with help from guests. The sessions provoke thoughts about worship, theology and the arts while providing practical skills in worship leadership through workshops utilizing innovative, hands-on teaching methods, Mathis said. The week culminates in a festival of worship, where students plan and lead a 15-minute worship service with their small group, and they worship with friends who have done the same. In 2012, Samford University was awarded a grant from CIOS (Christ is Our Salvation) Foundation to establish a center for worship and the arts at Samford whose goals were broadly defined, Mathis explained. The center provides resources for young people and communities of faith to enhance their worship practices, and offers opportunities for these same groups to explore the intersection between worship and the arts. The result of the partnership between Samford and CIOS became anima: The Forum for Worship and the Arts. Anima also received gifts from the Lilly Endowment Inc. as well as a second gift from CIOS in 2015. Now in its third year, Animate is an academy in worship, theology and the arts, and is one of the core focuses of anima. Its goal is to provide young people with spiritual formation, vocational exploration, service opportunities and individual and group instruction in all avenues of worship and the arts. Animate is staffed by Samford faculty and students, partner faculty and students from other colleges and universities, and prominent voices in worship, theology and the arts. The centerpiece of anima’s work and mission is anima: The Forum on the Web. This innovative website makes anima accessible all over the world, and its potential as an online resource for churches and schools is significant in this digital age. Anima: the Forum on the Web includes teaching videos, model worship gatherings and interactive opportunities for those attending Animate. Anima also provides a mentoring opportunity in worship and the arts through the Elisha Project, an effort to equip Samford students, other adults and congregations to mentor and serve adolescents interested in worship and the arts. The Elisha Project prepares Samford students for leadership roles in Animate, and has expansion plans to provide more resources for congregations and the Samford community to engage and explore topics related to adolescent worship practices, Mathis said.